During the winter, I reach for soup like I reach for lemonade in the summer. Nothing seems to beat a bowl of soup on a cold, winter day! This recipe is both quick and delicious. We’ve enjoyed serving it alongside grilled cheese/turkey sandwiches and as a complete meal in a sourdough bread bowl. It’s also a perfect freezer soup – so go ahead, make a double batch! Peel and de-seed squash. Cut into large pieces, place on baking sheet, drizzle with grapeseed or olive oil, and sprinkle with salt and pepper. If using additional veggies, add those to the baking sheet as well. Bake at 400 degrees for 1 hour. While squash is baking, fry 6 pieces of bacon. Set aside and remove excess grease from pan. Add chopped onion and garlic to bacon pan, saute. Place 4 cups of chicken stock, onion/garlic mixture, bacon and squash/veggies into a large stockpot. Bring to a boil. Reduce to a simmer for 10 minutes. 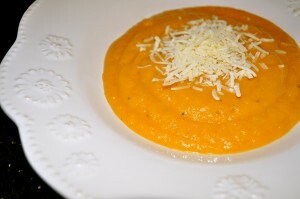 Scoop soup into a blender and puree to desired texture. Return to stockpot and season with sea salt and pepper. I have been making butternut squash soup for a while and have found some other yummies to add in: cut up polish sausage, feta cheese on top, tortellini…it’s such a great soup!